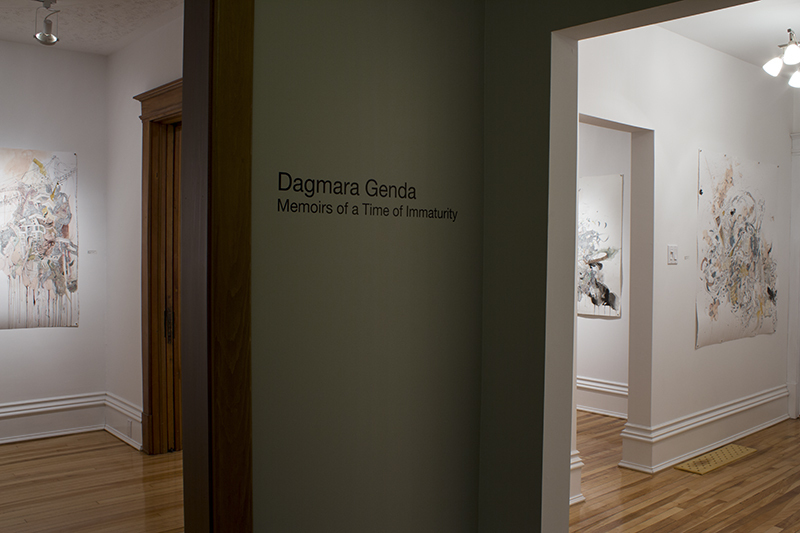 The following images are of Dagmara Genda’s exhibition Memoirs of a Time of Immaturity which ran from March 16 to April 6, 2013. 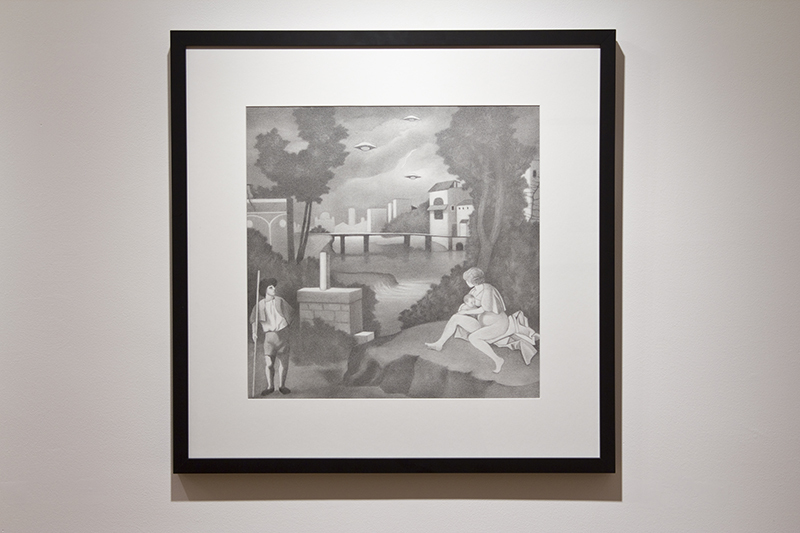 Dagmara Genda: Drawing has been a constant for me ever since I was a child. I think it was never overshadowed by other interests because, being from Poland, there was a language barrier that limited my ability to make friends and learn. My family and I emigrated in 1985 and we didn’t know one word of English. I took longer to learn the language than other children, or at least I’m under the impression that I did, because we spoke exclusively Polish at home. At school, rather than interacting with other people, and learning to read and write, I would just draw. It was a kind of escape from the sheer incomprehensibility of my surroundings. Upon entering art school I experimented with other forms of art, often trying to choose the best medium to explore a given idea, but drawing always resurfaced as my go-to form. 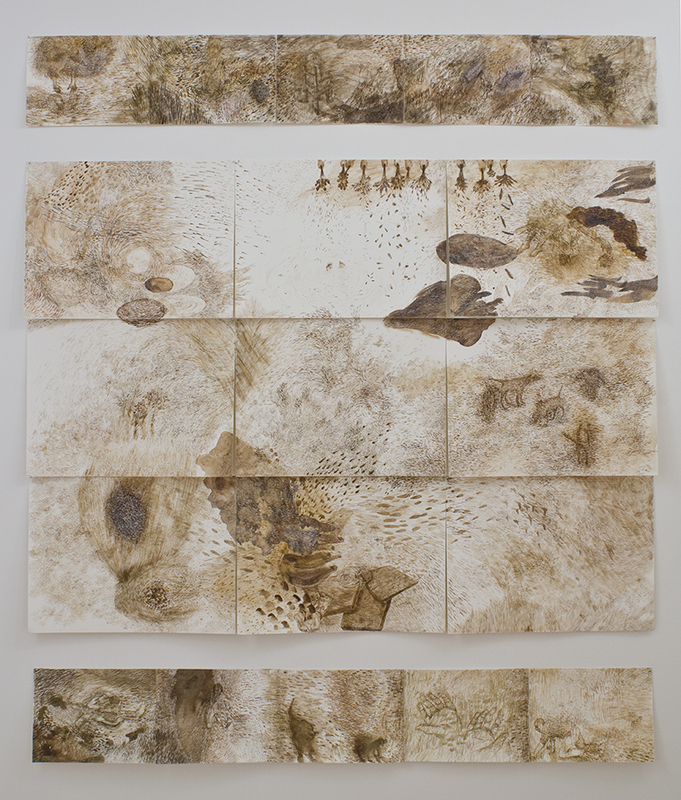 It has a connection to childhood, to immediacy, simplicity but also, through the medium of illustration, a highly complex and mediated language. It’s contradictory and therein lies its power. 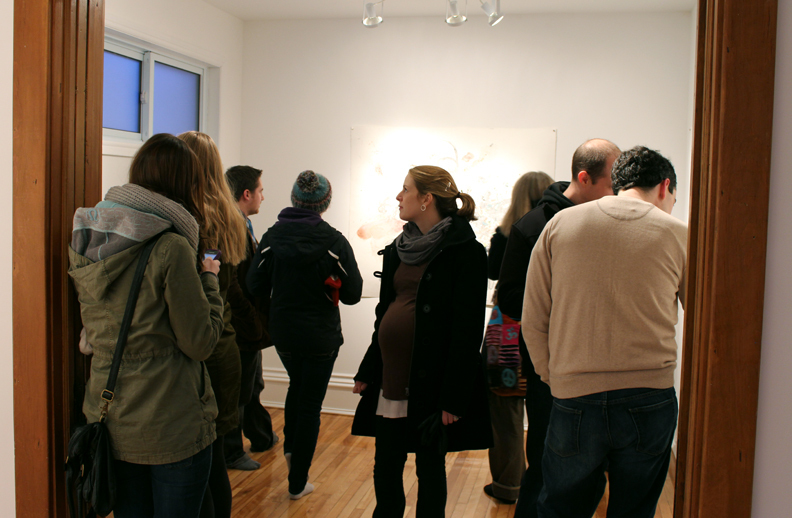 My art practice as such, I’d say, began in grad school when I was in between places to live. I spent all my time in the studio but didn’t want to make art anymore. Instead I’d trace the splatters of paint left on my wall from a performative video I had made. At the end of the summer, the paint on the wall was traced to form an intricate mural that was very compelling to me. 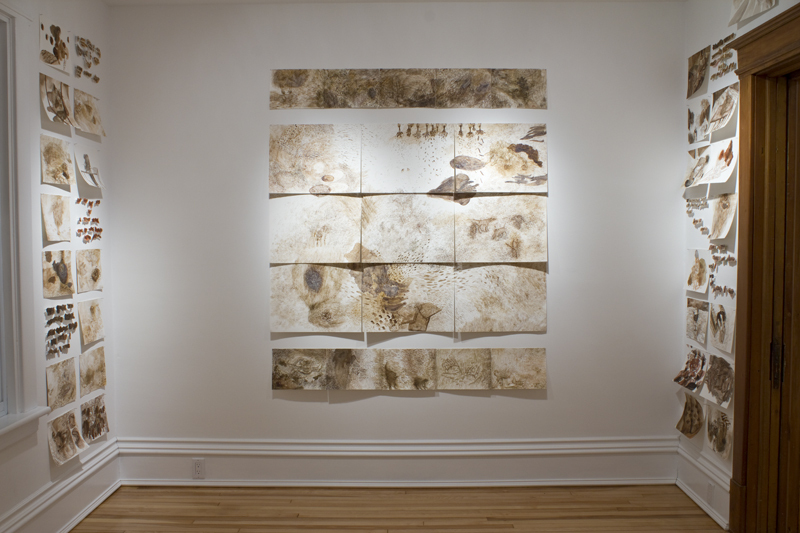 It connected to that prelinguistic impulse when I was first in Canada as well as to various cultural modes of mark-making which in themselves are their own vocabulary. I decided that was going to be what I did from then on. LG: How does your own life experience and cultural background contribute to, or influence your work? Where do you draw inspiration from? DG: Inspiration is a funny word. It implies a sudden impulse to create, or in the Judeo-Christian sense, an influence from God. I’ve been working too long to have my ideas come from inspiration. It is not sudden in the slightest nor do I get eureka moments. It is a process of labour that evolves from a step-by-step process and builds on itself. It’s profoundly boring and unromantic. That being said, my life experience and background certainly influence my work. In some ways that’s a platitude. In my case the notion of identity is particularly important, not only national identity, but also ontological identity. How do we come to identify something as being what it is? What does it mean that something is identified in a certain way and can that change? Being Polish and Canadian, as well as a kind of foreigner to both identities, I feel as if I am keenly aware of the performative nature of identity and of the self. 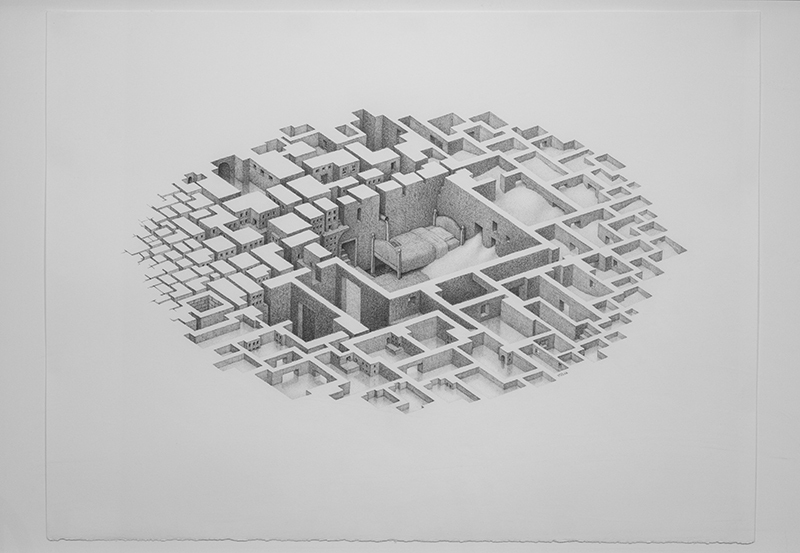 As such I try to rupture various tropes in my drawings, such as Polish architecture or Canadian art history, so as to see them in a new light. 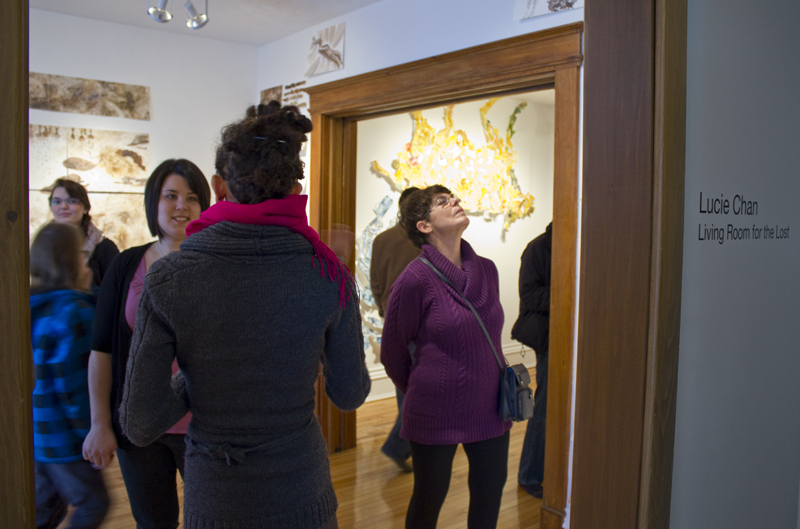 On March 15, 2013 Line Gallery hosted Dagmara Genda’s reception. 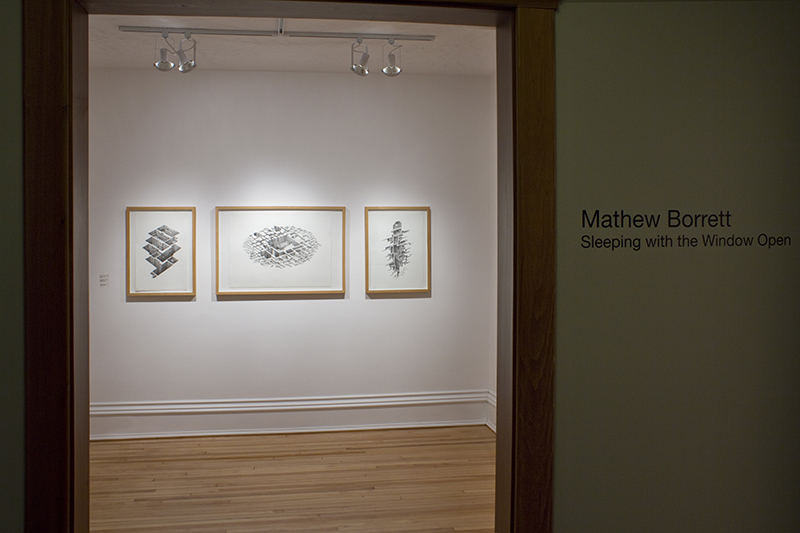 The following images are of Mathew Borrett’s exhibition Sleeping with the Window Open which ran from February 16 to March 9, 2013. Line Gallery: How does your own life experience contribute to, or influence, your work? Where do you draw inspiration from? Mathew Borrett: I grew up in a rural environment, with not a lot of other kids around. We had some woods on the property which bordered on a marsh inhabited by beaver. Of course this made for a wonderful playground. We had a big old timber barn built in 1899. I didn’t fully appreciate how lucky I was to grow up living in such a setting. The only thing was I’m allergic to horses and hay and whatnot, and there was plenty of that around. This meant that during allergy season I would take refuge in my room, safe from pollen and dander and other sniffly stuff. I couldn’t resist building the odd hay-bale fort, but I didn’t have the self-control to resist rubbing my itchy eyes, which resulted in having to go sooth them with a cold cloth, hay-fort abandoned (these were often elaborate, multi-storied hay-bale forts). Thankfully my grandmother had supplied me with a large pile of lego over the years. I even had some hand-me-down lego from the 60’s with faded colours and warped plastic. I think I can still remember a rough inventory of all my lego even now. I had it all systematically organized. I built lots of castles and spaceships and sometimes robots. A couple of times I was so proud of my creation that I would grab a pad of graph paper and some markers to draw instructions for how to build it again. When I wasn’t doing that I would spend a lot of time on my commodore 64, playing video games and making art with it. I was always drawing or building something, exploring the woods, or playing in the barn. Idyllic circumstances to develop my creativity. Another major source of inspiration is that I have a highly active dream life. At times, I’ve felt like I inhabit a dream world as vast as the physical world around us. In addition to the real house I grew up in, there were countless dream version of that house, some of which were bigger and fancier, and many others that were in some state of ruin. Often there were basements below the basement. 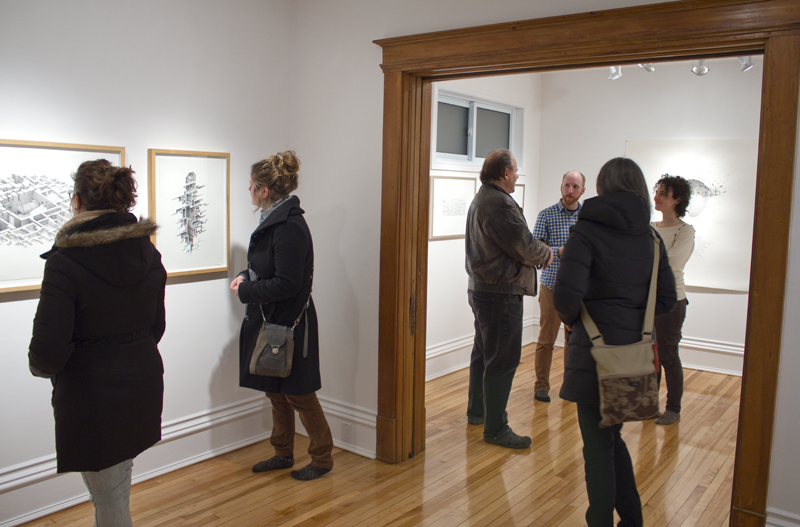 On February 16, 2013 Line Gallery hosted Mathew Borrett’s reception. 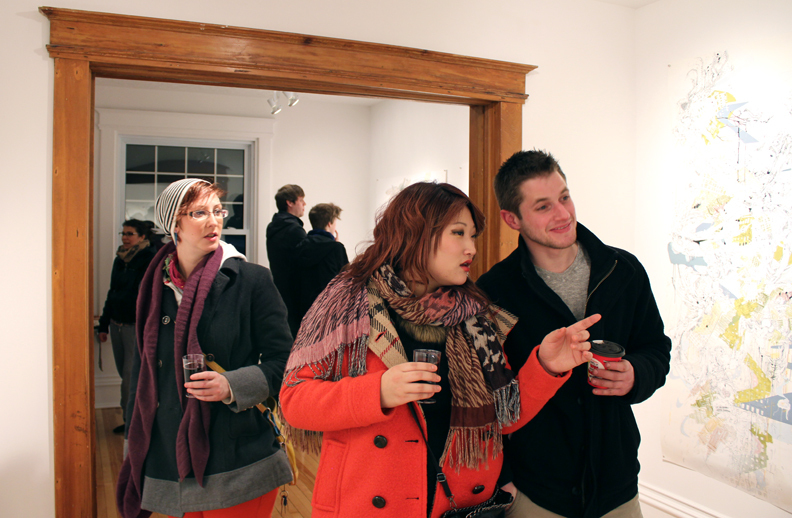 The following images are of Lucie Chan’s exhibition Living Room for the Lost which ran from January 19 to February 9, 2013. Lucie Chan: I chose it because it doesn’t come with hardware, machinery and you can generally do it anywhere, it’s economical, it can be anything, and people are always eventually moving onto other media and end up giving away their drawing supplies. LC: My question is: Is drawing important?? 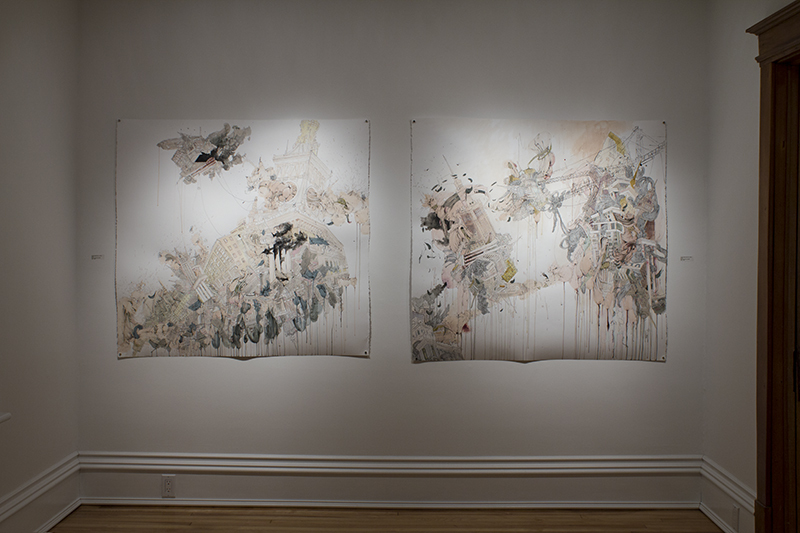 (in contemporary art). I like that there are movements that are carried on from history or won’t go away and are still changing, repeating itself, raising questions about why people still do it. Drawing as a practice has slowed down how I look at things and reflect on them. It has made me more of an observant human being. 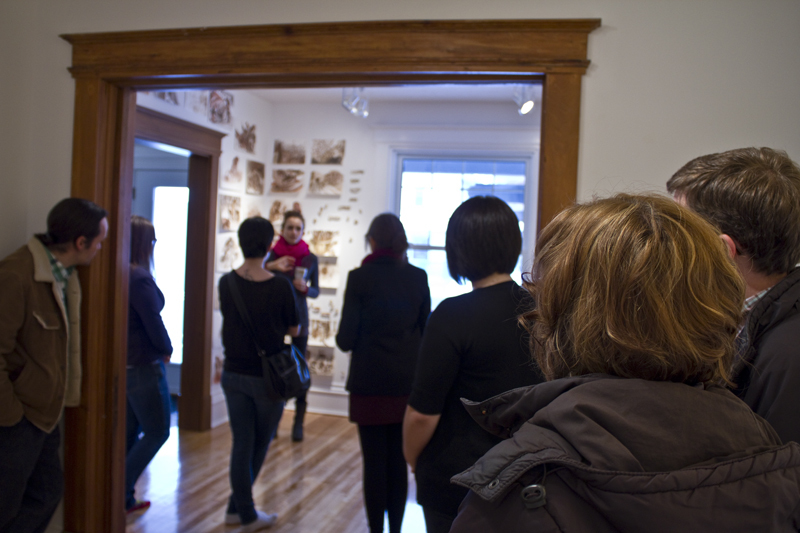 On January 19, 2013 Line Gallery hosted Lucie Chan’s artist talk and reception. 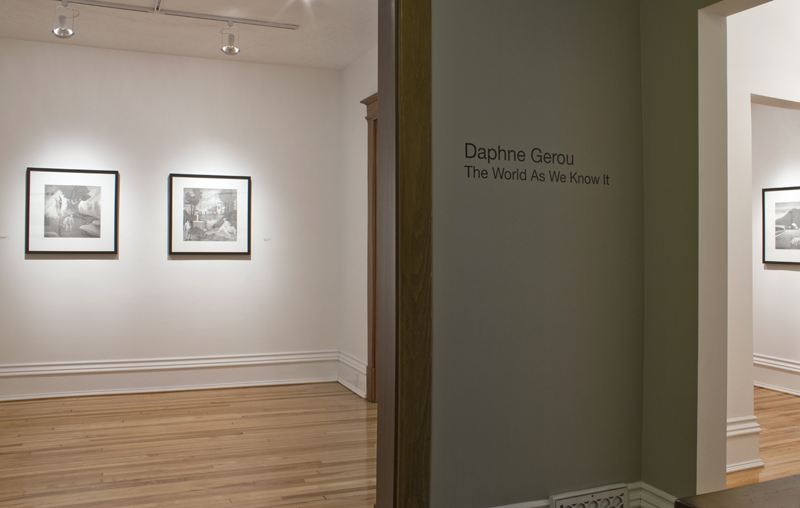 The following images are of Daphne Gerou’s exhibition The World as We Know It which ran from November 24 to December 15, 2012.